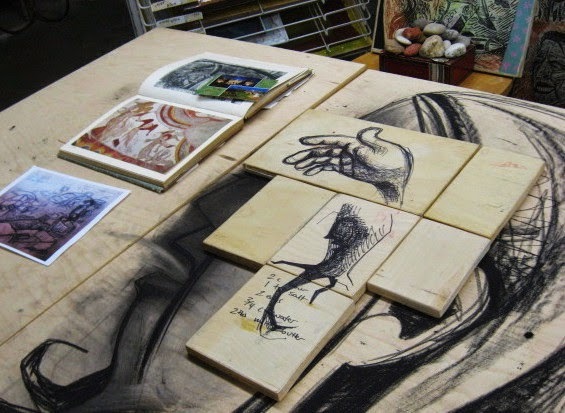 Two meetings of the spring woodcut session in Belmar down, with two to go. Since the second meeting my two students had been busy. One had gone ahead and ordered a bunch of woodcut tools, received them by the end of last week, and was making progress on her first block. The other one opted not to order new tools, but was using some old linocut tools she found at home. Linoleum tools don't give the level of control of sharp woodcut tools (and these arrive from the factory pretty sharp), but her image was a rough design and she figured they would do fine. And they did. Upon arriving she borrowed some of the class tools to fix a few detail areas, and about halfway through class she was ready to try a first proof. Above is the proof and block, pulled with water soluble black and Rives Lightweight paper. Her plan is to cut back some of the dark areas a little, make the whole thing more readable. Meanwhile my other student should be ready to proof hers by next week, so I expect we'll have some nice prints to show in week four. 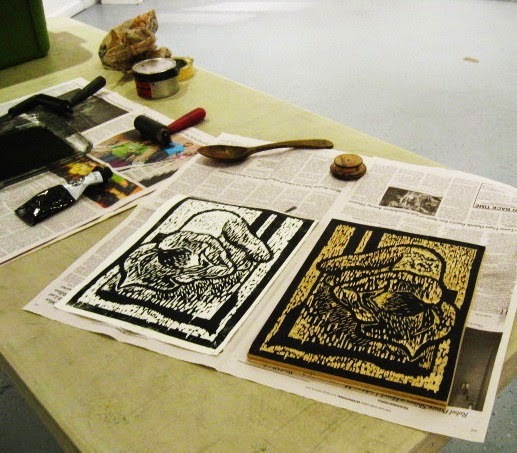 We are in week 2 of the spring edition of woodcut class at the Belmar Arts Council. Just two students this time, but that's enough to be worth holding it. Both relatively new to the process, but they are excited, so good stuff will likely happen. In typical fashion we got real busy and I didn't think to take a photo until they were already gone, so all you get to see is the mostly empty tables, with just a couple of bench hooks and some bags of tools. Maybe next week I'll remember. I had been a little worried about today because early forecasts called for rain all day, but that ended early, and we had a brief bit of sunshine at the time I arrived at the Boatworks. 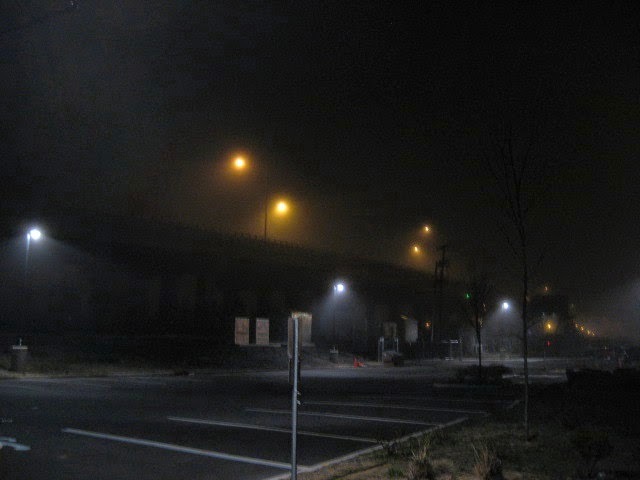 But then it got chilly and foggy, which didn't affect us inside. Still cool and foggy at the end of the night, but better than rain (predicted to return tonight) so I was able to reload my car, and then carry the stuff into my apartment, without everything getting wet. 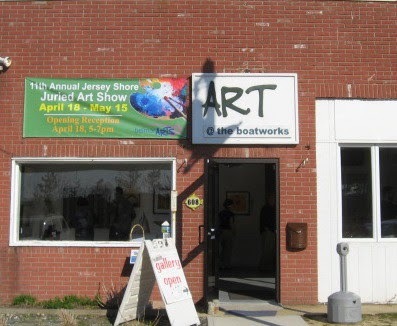 Tonight was the opening reception for the 11th Annual Jersey Shore Juried Art Show. This was the annual exhibition that introduced me to the Belmar Arts Council, when I saw an ad in the paper and decided to enter the 2nd Annual version, back when the BAC had to borrow a vacant store for the gallery, and was holding meetings in the loft of a coffee house. I worked hard to finish the newest supermarket print in time to submit to this show, but the juror decided to accept an older one instead. Just getting in was good- only about 38% of the submissions were accepted. This show always draws a big crowd, and the first really nice weekend of the year brought huge crowds to the shore. We are estimating about 200 people came through. I got a nice surprise when I arrived and discovered my piece had received an award from juror Janet Cook. Not the top award, or the next 4 prizes, or even the six special merit awards. 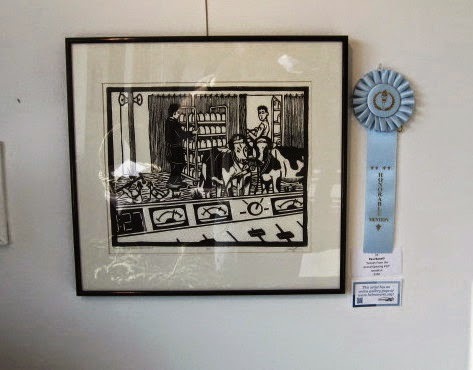 (the juror really liked a lot of the pieces for different reasons) I was given one of six honorable mentions, which earns me that title, the pale blue ribbon you see above, but no check. The piece did receive many compliments. Dr. Keith Calmes, classical guitarist who was there to provide music for the reception, even mentioned a desire to take my woodcut class, but has feared the risk to his hands, which I can understand. The JAS 11 will remain on display at the Boatworks through May 15, 2015. Regular gallery hours are 1 to 5 pm, Wednesday to Saturday. Admission is free. It seems like it's been months since we held our critique on the traditional first Monday of the month. A lot of the postponements have been weather related, but it finally feels like we're done with winter. This month it was the Easter/Passover holiday, and the second Monday didn't work for me as my latest Belmar woodcut class started that night. Molly said that Wednesday worked well for her, and I had no conflicts, so that became the plan, and we got the word out. Or thought we did. Of the 10 people on my e-mail list, only 3 replied at all, and those were mostly negative. Had no idea what Molly heard from her texting group. Driving up route 71, as I got close to our building, I figured there would be trouble. I saw quite a few cars parked in the rough dirt field behind our building. That only happens when there's no room in the front paved parking lot. I was surprised to see one empty spot when I got to the front, right in the middle of the lot so it must have just been vacated when I had arrived. I had looked at the building website this afternoon to see if anything was going on tonight and saw no performances tonight, though this weekend will have some. Inside the building, way too many theater types, to the extent that they were occupying the basement cafeteria, the normally vacant room across the hall from the Studio, and even rehearsing in the basement hallways. I had gotten to Ocean Grove early in case parking was difficult, so I used the extra time to get dinner, a slice across the street, and waited for our people to arrive. And waited. And waited. At 7:15 I was still the only one in our room, though there was a lot of chaos out in the hall. Then we got our first arrival, Christina, not a regular, but a friend of Molly's who comes maybe a few times a year. Said she had just heard from Molly and that she'd be just a few minutes. Actually she arrived around 7:30, but had cold beer which makes up for tardiness. But that was all our attendance for the night. Christina had little new stuff to show, so brought something old (but new to us) a gray ceramic wedge (above left) that resembled a very much past its prime hunk of swiss cheese. 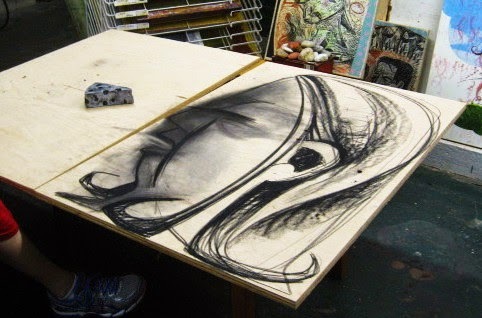 Molly had the above sketch on wood, the start of a diptych she's planning. This led to a discussion of the body of work she has on display upstairs, from the WinterArts festival. Meanwhile, I showed my most recent work, the supermarket parking lot/bricks image. Molly knew the story from having seen it in progress for months, but hadn't seen the final version, and it was all new to Christina, so I took a few minutes to tell the tale. They were impressed with the results. Christina noted how different it looked between the proof right in front of her and the one hanging on the wall, the intense marks seen up close blending into value tones seen from a distance. And that was it. Because of the late start and our visit to the 1st floor, we actually went a little past 9 pm, but the building was still full so it didn't feel late. A couple of weeks ago I got a call from Molly asking me to forward an e-mail to the members of our critique group. One of the regional non-profit arts groups (NJ/Eastern PA) that she has worked for, Young Audiences, would be hosting an event in our building in Ocean Grove. 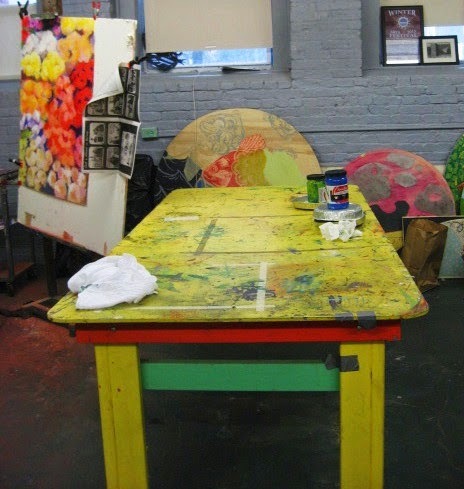 Called Artist to Artist Lunch 'n Share, it would be a gathering of creative types who had worked for them, to have a lunch and a discussion of art, which would include Molly doing a demonstration of silkscreen printing, as she might demonstrate to school students. The only other thing I knew was that her boyfriend, an occasional professional cook, including the omelet station at a local Asbury bar, would be doing the cooking for the meal. The event was scheduled for mid day and mid week, so I had doubts as to how many might show up, but I sent it out. I didn't register for the event, figuring I would just show up, if for nothing else but making sure that my part of the Studio would be in shape, plus free food. Didn't know exactly what it would be, but I'd eaten Sean's omelets a few times and found them tasty, and if not being registered meant that there wouldn't be food for me, I could just grab a slice across the street and come back. I got there about 45 minutes before the start, Molly about 20 minutes later. 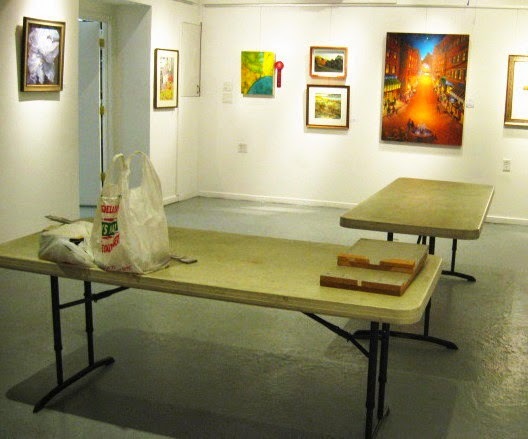 My table was still semi-organized from the Open Studio event, so I just moved some large things off and under it, then went up to the 3rd floor for the lunch portion, as Molly was busy clearing off her central table (below). That is the cleanest that table has been in a few years. She joined us before food was served. I had left my bag (and camera) downstairs, so I have no photos of the lunch. It was up on the newly renovated 3rd floor (where we had the ribbon cutting and dedication brunch last year) and 15 people had signed up, so it looked like there'd be plenty of food. Steam trays of a south Asian curried chicken and vegetable dish (as well as a tofu version for the soylent crowd), steamed rice, various Thai style condiments, and salad. Plus a platter of tasty lemon cookies, and iced down beverages. None of my mailing list was in attendance, but I was sitting with Michelle and Adele, two old friends of the Studio and occasional critique participants. While there I also met Nanci Hersh, who I had never seen before in person, but with whom I had collaborated on the international post card project in 2010. The card that she started and I finished can be seen here in all the posts from April 19th to April 29th. After lunch, Molly showed some digital slides of her work, while others shared poetry, photos, and other related stuff. From there we led people down to the first floor, where the large displays of our woodcuts were still hanging in the hallway from the WinterArts Festival, then we took the trip down to the basement. Molly talked about the basics of how screens can be made, with the focus on her low-tech method of creating photo based images. (photo emulsion + glass coffee table + clamp lights + subject = screen) She had several screens with photograms of plant images, literally photo silhouettes of leaves, stems, roots, etc, and a few hues of green ink, and showed how easy it was to layer such images on paper or cloth. Since this is an education based group, it showed how easy it would be to do such a project with school kids, and most of the crowd created a plant image collage to take home. After everyone left I cranked out a quick proof of a student woodcut for someone in tomorrow's 2D class, cleaned up, and headed home. At some point my cable television provider added the Boomerang network to my package. This seems to be a division of the Cartoon Network. They specialize in mostly older cartoons (one slogan was something like "your favorite shows are coming back to you"), though for some properties they have modern versions as well. For example, they have various hours devoted to vintage MGM Tom and Jerry cartoon shorts, but also an hour of newer Tom and Jerry cartoons with voice work from contemporary actors. They have an hour of the original Scooby Doo cartoons of my youth, but also a 21st century series as well. It's been long known around here that my all time favorite cartoons are the 1940's and early 1950's Warner Brothers shorts, especially with Bugs Bunny. Above is a fragment of a large colored print from 2007-8 called A History of Art, a Babel inspired tower made up of dozens of things that influenced me to want to be an artist. 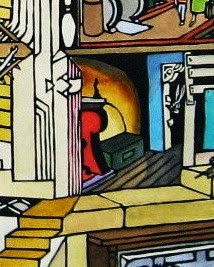 The room shown above is based on Grandma's Cottage in the mid 40's cartoon Little Red Riding Rabbit. For me, the details of the background paintings was just as important as the animated characters and jokes- great surface textures of woodgrain and hand applied plaster over lath walls, etc. More details about this can be seen in this 2007 blog post. Anyway, starting yesterday, in honor of Easter weekend they are showing all Bugs Bunny. As with their regular schedule, that includes both golden age shorts, and a contemporary Looney Tunes series, but it's the old ones that I have put on when there's nothing else interesting. For example, today I saw a 1948 short called Mutiny on the Bunny, one of a series of cartoons with Yosemite Sam (here named "Shanghai Sam") as the captain and sole crew member of a large sailing vessel in a conflict with Bugs. 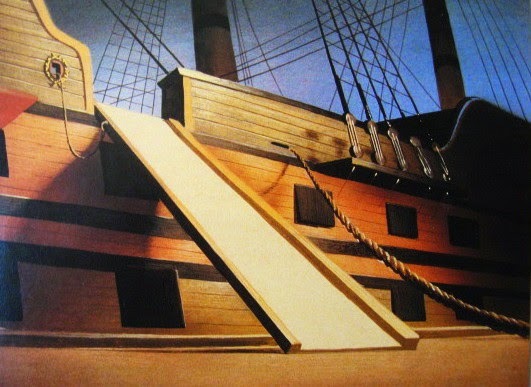 Above is a background painting from this cartoon of Sam's ship, the Sad Sack, just before he kidnaps Bugs to be his new crew. Sam is not my favorite antagonist for Bugs ( I prefer confrontations with Elmer Fudd, Daffy Duck, and many one shot villains), so it's not one of my favorite cartoons. Not as funny as the Red Riding Rabbit cartoon. But from the time I was young I always admired the artwork in these ship captain Sam cartoons. The above background painting, credited to Paul Julian, may not be quite to the level of Vermeer or Caravaggio, but it certainly impressed my younger self. The color, use of shadows and perspective, the details, every time I saw this it made me want to be able to draw/paint well enough to do something like that myself. Later, as a full time art student, the names mentioned above and many others became my heroes, but I'm still affected by the art in old cartoons. These new Looney Tunes episodes aren't all bad, it's clear there is a reverence for the originals and they are trying to make something entertaining, but they come up very short on the quality of the art. Last week was the deadline to submit work to the Belmar Arts Council's Annual Juried Show, which spans the entire existence of the organization (I believe this was the 11th) and is the most consistently popular show they have. It gave me a good excuse to finally finish my most recent block, the bricks in the parking lot print, and I got it done with a few days to spare. We could submit up to two, so I searched my records to come up with something I haven't yet shown at the Boatworks (more than 400 prints and counting so far) and eventually settled on the one above. Another supermarket print, which I called #10 on the entry form. My records showed that title popping up in exhibitions in 2002/2003, so it may date from that time. It's based on a new large supermarket that was built out on the highway in my town. They were advertising an appearance by the current Miss Chiquita Banana, so I thought there could be a print possibility, or at least an attractive woman in a festive and/or exotic costume. No banana girl showed up, but I spent a little time exploring the store, and I discovered that there were odd recordings being played toward the back. Approaching the milk shelves started the sound of mooing cows, while proximity to the eggs brought us clucking chickens. This led me to consider that they had to have recordings of the farm animals, if not actual animals there, cued to start making noise when people arrived. I knew from observation that there was a room behind the milk shelves (unlike the traditional set up where shelves are stocked from the aisle, milk was restocked by moving aside a heavy curtain, then pulling the empty rolling shelf cart into the room and replacing it with a fully loaded one. 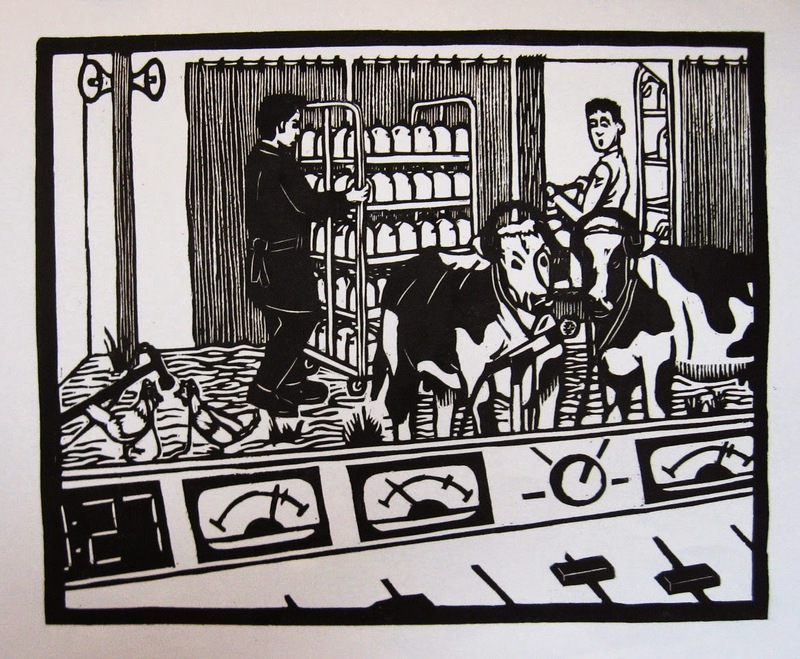 So my point of view is from the back, looking past the sound mixing board (based on one common to college radio stations I worked at), past the cows and chickens with headphones and clustered around microphones, and out to the store where a surprised customer catches a glimpse while the milk shelf is being changed. A fun and popular print in the series. The juror's decision was supposed to be announced yesterday at noon, but that got pushed back to today at noon. Then more hours passed, but late in the afternoon they posted the list of chosen works and this older supermarket print made it, while the brand new one was rejected. No predicting these things. I'm sure the bricks will be seen eventually, but for now my concern is getting the print ready for the show. I may have a framed copy in storage. If not, then I have to switch one out. More than a week before we drop stuff off, so there's time.